Catelynn Alpiger of Eastern High School and Dallas Derringer of Southern were honored as the Courier-Journal Special Olympics Athletes of the Year. 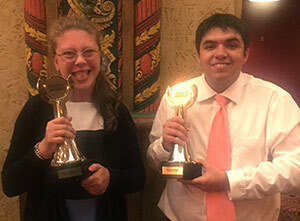 Louisville athletes Dallas Derringer and Catelynn Alpiger were honored as the Louisville Metro Special Olympics Athletes of the Year at the annual Courier-Journal Sports Awards. The recognition came alongside dozens of Kentuckiana High School athletes honored on June 12 at the Palace Theater. Derringer graduated form Southern High School this year and has been a Special Olympics athletes for eight years. He began his Special Olympics career in the bowling program. From there, Derringer has gone on to compete in basketball, soccer, skiing, flag football and softball. He has been a member of the Southern High School team in the Jefferson County Public Schools Unified Basketball league each of his four years with the Trojans. However, bowling has been where Derringer has stood out the most. In 2016 he represented the State of Kentucky at the Special Olympics Unified Bowling National Invitational Tournament. In February, Dallas rolled a crucial strike late in the championship round to claim the first ever KHSAA Unified Bowling State Championship with his partner Nathan Burnett. In addition to sports competition, Derringer has become an accomplished public speaker as a Global Messenger, has appeared on television promoting the program and presented at the program’s annual Sneaker Ball gala last fall. Catelynn Alpiger has been a Special Olympics athlete for 14 years. A 2017 graduate of Eastern High School, she is part of the first generation of athletes to enter the program through the Special Olympics Young Athletes Program, beginning when she was just five-years-old. Her first Special Olympics competition came in the bowling program in 2005. Since then, Catelynn has competed in cheerleading, equestrian, soccer, basketball and softball. She has been a part of the Eastern Eagles team in the Jefferson County Public School Unified Basketball League each of her four years at the school. In addition to Unified basketball, Catelynn has competed with Eastern High School’s Unified track program and participated at the KHSAA State Track Meet last year. Each award presentation was preceded by a short video produced by the Courier-Journal about each athlete. Catelynn’s announcement at the end of her video that she wanted to keep participating in all of her sports except track earned her a shout out from featured speaker and US Soccer Olympic and World Cup legend Mia Hamm. Derringer and Alpiger were honored on the same stage as Ballard baseball star Jo Allen, who was taken 10th overall that same night in the Major League Baseball Draft; swimmer (and Special Olympics volunteer) Brooke Forde and five-star basketball recruit Romeo Langford. Being recognized among other outstanding high schoolers was important to both our athletes and their parents. This was the second year that the Courier-Journal has included Special Olympics athletes as part of the awards. Last year’s honorees were Jamil Danzy of Ballard High School and Hannah Ballard of Southern High School. For more information about the Courier-Journal Sports Awards, contact Mark Buerger, Director of Communications and External Relations at 502-695-8222 or mbuerger@soky.org.